In Loving Memory of / A dear husband and dad / Richard Lawrence, M.M. / who died 29th July 1975, aged 81 years / Also a dear wife and mother / Nellie Lawrence / who died 8th August 1987, aged 92 years / Also Flt. Sgt. Leonard Lawrence, D.F.M. 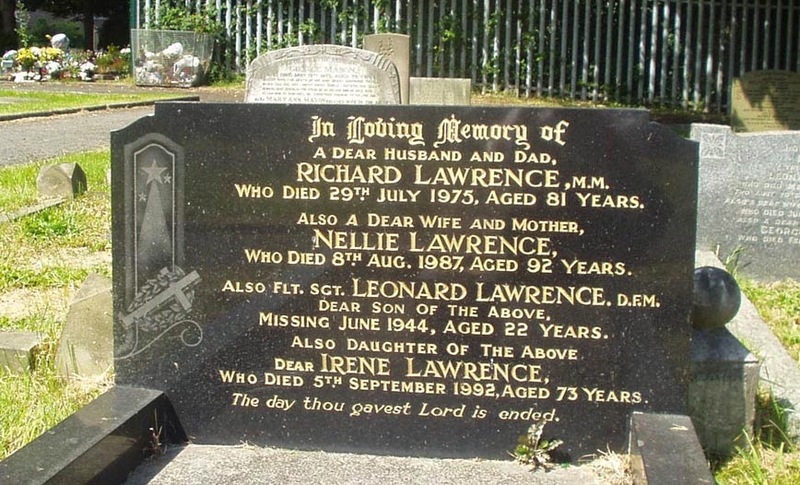 / Dear son of the above / Missing June 1944, aged 22 years / Also daughter of the above / dear Irene Lawrence / who died 5th September 1992, aged 73 years / The day thou gavest Lord is ended. Leonard is also remembered on the Ardsley, Christ Church, Christ Church Parishioners - WW2 plaque. He is remembered on the Runnymede Memorial in Surrey and commemorated on the Commonwealth War Graves Commission website.